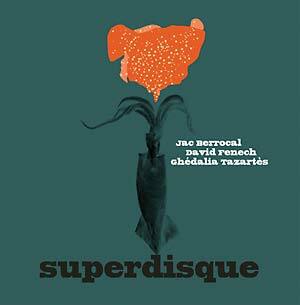 Superdisque is the first album from the French trio formed by David Fenech (electric guitar) with Jac Berrocal (trumpet) and Ghédalia Tazartès (vocals). Somewhere beyond the borders of rock, jazz, punk and sound poetry -- the vocals seem to come from another planet, with lyrics in an improvised language. The winds are blown from Tibetan human bones and conch seashells. Guitars sound like rubber and steel. Expect the unexpected. Special guest Zap Pascal (accordion) appears on one track. David Fenech is a French musician living in Paris. He has played and recorded with musicians such as Felix Kubin, Jad Fair, Tom Cora, Rhys Chatham, Bérangère Maximin, James Plotkin, Shugo Tokumaru, Ergo Phizmiz, and many others. His baroque style has been described as "a kind of punk musique concrète." He is the origin of the Superdisque recording project, using his own home studio as an instrument. Jac Berrocal is a cult trumpet player living in Paris. He has played with various musicians including Pascal Comelade, Jaki Liebezeit (Can), Nurse With Wound, Sunny Murray, Jacques Thollot, James Chance, Pierre Bastien, Aki Onda, Lol Coxhill, Catalogue, Christophe, etc. He's also known for his famous Rock And Roll Station, recorded with Vince Taylor. Ghédalia Tazartès is an orchestra and a pop group in one person. His voice shifts constantly from child to diva, from African sorcerer to Tibetan monk. His hypnotic, disturbing polyphonies draw us into an emotional universe. It's punk, sound poetry, folklore and electroacoustics rolled into one. Ghédalia has been recording music in his Parisian home studio for more than 40 years. He has also worked for theater, dance and more recently for cinema. Both Jac Berrocal and Ghédalia Tazartès appear on the famous Nurse With Wound list. CD version includes one bonus track not included on the LP.